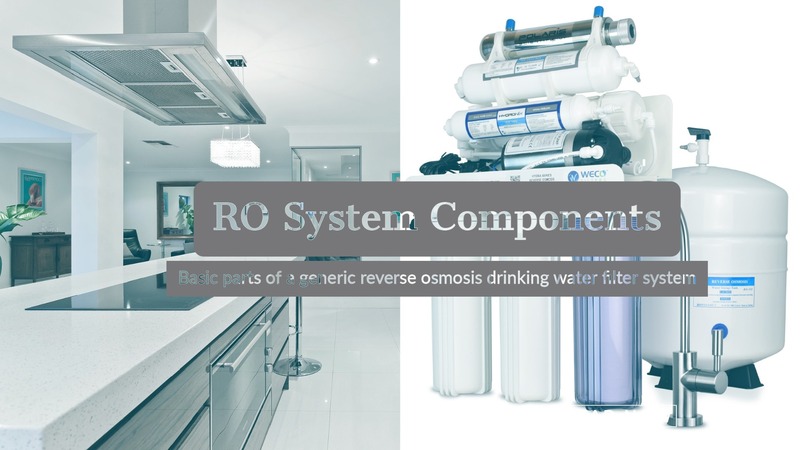 What are the main components of a residential reverse osmosis drinking water filter system? 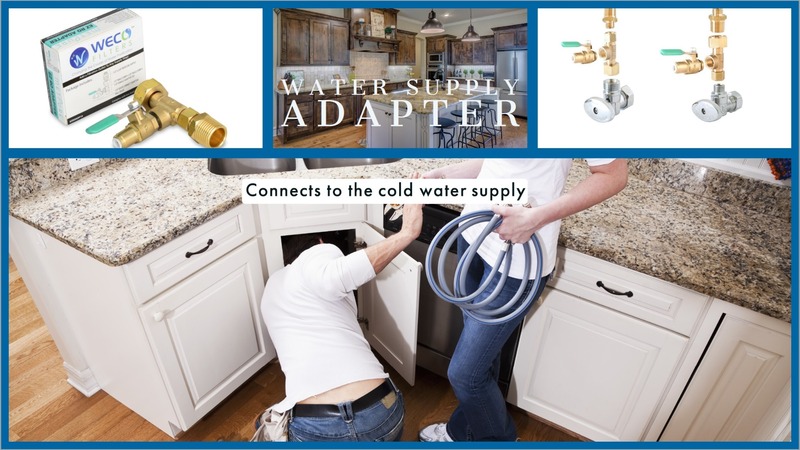 A water supply connector also known as a feed water supply adapter connects to the house cold water supply as the source of water to the reverse osmosis filter. 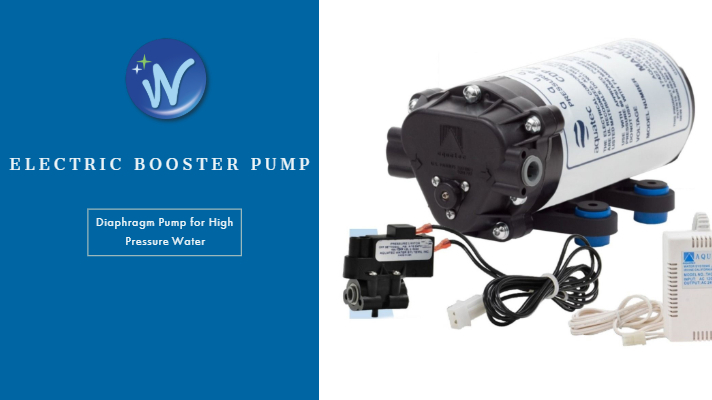 WECO RO systems come with an adapter that fits both 1/2" and 3/8" supply valves. Your manufacturer may include a variety of fittings, valves, and saddle valves that are available to best match the plumbing configuration. The sediment cartridge removes sand, grit, precipitated mineral particles, insoluble iron oxide and other debris that can clog the reverse osmosis membrane surface or plug the drain flow restrictor, causing reduced water production. Most WECO ro systems use sediment filters rated to remove particulate matter down to 5 micron. We recommend replacing this filter at least every 6 months. TINY ro sedeiment filters need to be replaced every 3 months. Drinking water is disinfected by city utilities to prevent growth of harmful bacteria, viruses and other microorganisms that can cause searious illnesses and/or death. However, these chlorinated water supplies can deteriorate TFC membranes over time. Most city water utilities require water leaving the plant to have a minimum chlorine level of 1.0 mg/L (1.0 ppm). After 1000 ppm-hours of free chlorine exposure, the RO membranes may allow increased TDS passage (less contaminant rejection). The carbon filter removes chlorine and protects the membrane downstream of it. Water utilities like the Los Angeles Department of Water and Power (LADWP) recently started using chloramine to disinfect water. The new standard was by the US Environmental Protection Agency and the State was the result of numerous studies linking the chlorine disinfection by-products to a higher risk of cancer. Reverse Osmosis membranes are able to withstand a higher concentration of chloramines (1 to 2 ppm) versus chlorine (0.1 ppm) before damage to the membrane can lead to lower salt rejection. However, metals such as iron or aluminum in water can act as catalysts and accelerate the oxidation of membranes even at low concentrations of chloramines. Activated carbon is also effective against chloramine. However, since the amount of activated carbon required to provide sufficient contact time for effective chloramine removal is about 5 times that needed for chlorine, most WECO reverse osmosis systems are equipped with a 0.5 micron carbon filter specialy rated for chloramine reduction. Conserves water by eliminating the drain flow when the tank is full. Main purpose of the ASO valve is to controls the water supply to the reverse osmosis membrane. When the pressurized storage tank fills 2/3 of the feed pressure, ASO valve cuts off the water supply to the membrane and waits until the tank is drained down to 1/3 of the feed pressure before turning water back on. RO membrane does most of the heavy work in the system. It removes over 96% of total dissolved solids (i.e. salts, minerals, metals), microorganisms and organic substances in water. Membrane divides the water flow into two streams. Filtered water from the membrane goes to the storage tank. Reject water goes into the drain. Most standard RO systems produce around 4 gallons of waste water per 1 gallon purified (4:1) if you're on a city water supply above 70 PSI water pressure. This ratio is controlled by the flow restrictor on the drain line. WECO VGRO systems only waste 1 gallon for every gallon purified since they employ water saving GRO membrane technology. 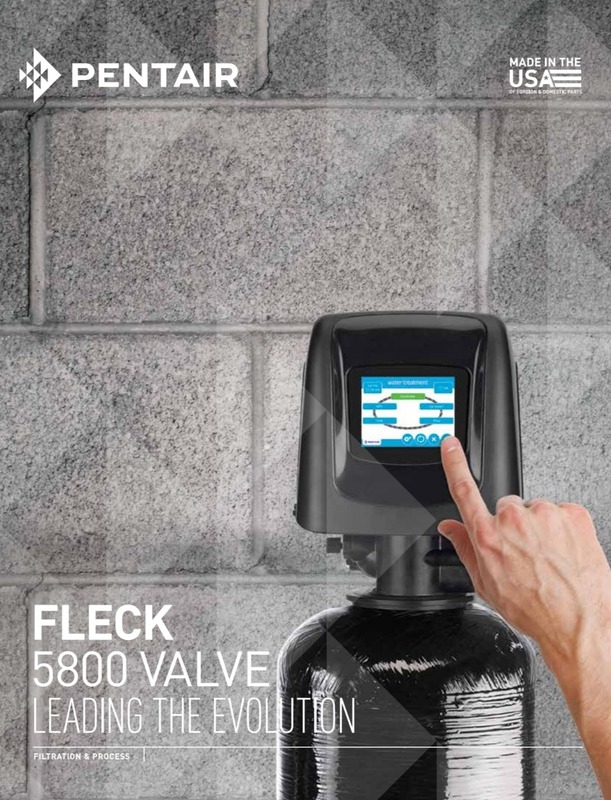 Check valve prevents pressurized filtered water in the storage tank from flowing back and rupturing the RO membrane when the ASO valve turns off the feed water pressure to the membrane. Our systems employ a check valve on the permeate (filtered water) line immediately after the membrane. A granular activated carbon polishing filter removes any remaining tastes and odors in water. Since water flows very slowly through ths filter, the "contact time" is higher and this leads to higher adsorption effectiveness. The pressure tank in a RO system stores filtered water from the membrane permeate and provides water under pressure when the drinking water faucet is turned on. A bladder within a metal or plastic case separates a water chamber from compressed air. 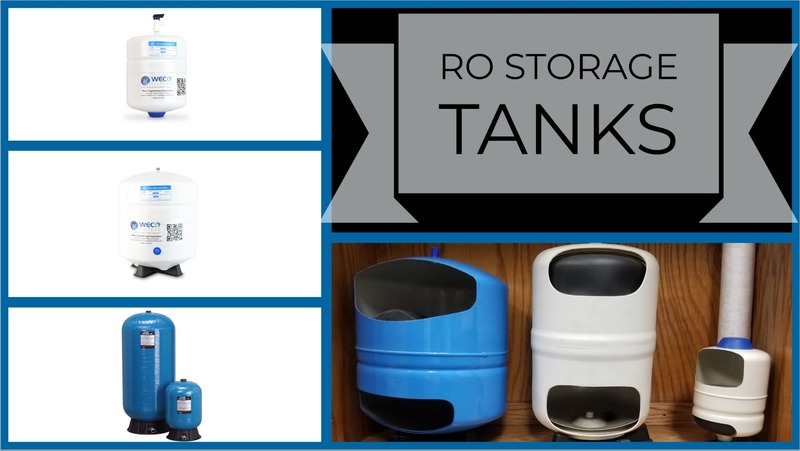 When the tank fills up with RO water, the bladder expands and further compresses the air inside the casing. Opening the faucet causes the air under pressure to push the water out. 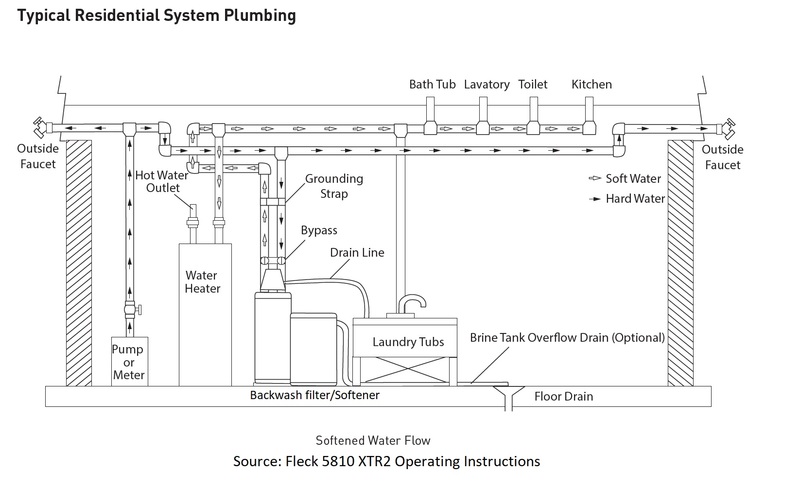 Residential under sink RO water storage tanks typically has an empty tank air charge of 5-7 PSI. Increasing the air charge will reduce the volume of stored water. Lower empty tank air pressure in the tank will result in lower flow rate from the drinking water faucet. 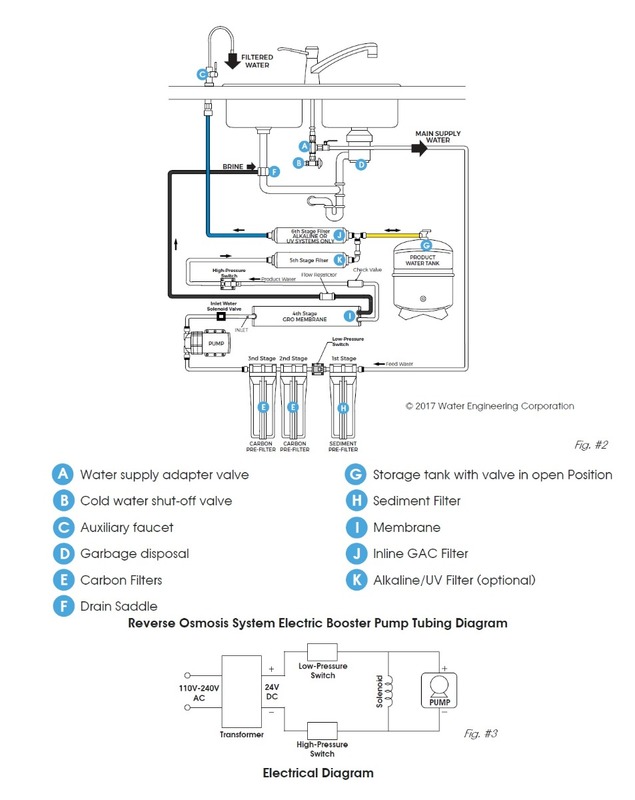 Reverse Osmosis System Components. (n.d.). ANAN Knowledge Base Administration. Retrieved from https://wqa.org. What types of whole house water filtration systems are out there? Whole house water filters can be either cartridge based or tank based. They each feature different components that perform unique functions. Tank based filters also go by 'backwash' or 'self-clean' filters since they clean and reuse the filter media by pumping water backwards through the filter bed and flushing trapped contaminants down a drain. Cartridge based filters are much cheaper upfront, easier to install and does not require much space. 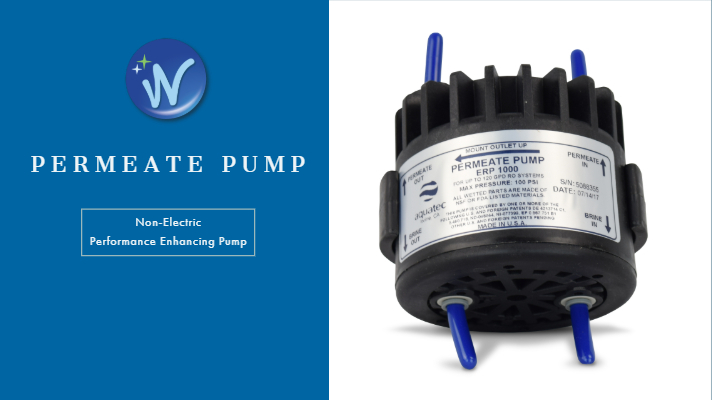 They do not require a drain connection and can even operate at low house water pressures. However, the filter cartridges may need frequent replacement depending on your water quality and water use. Unfortunately, cartridge based filters can severely restrict the water flow and pressure. Tank based filters are less restrictive of the water flow. We try to recommend these systems whenever we can, because of the excellent water flow, longer media life and enhanced contaminant reduction performance. However, tank based systems require more space, electricity to operate the control valve and connection to a drain pipe. We recommend hiring a plumber to do the installation. Please note that a minimum of 20 psi (1.4 bar) of water pressure is required for the backwash/regeneration valve to operate effectively. You must have an air gap on the drain line to prevent back flow of drain water into the system. A 2x the drain line pipe diameter air gap is required with a minimum 1" air gap. Cartridge filters like our Big Blue or DP-Big can be retrofitted with sediment, carbon or multimedia cartridges. A sediment filter removes sand, grit, precipitated mineral particles, insoluble iron oxide and other debris. Carbon filters eliminate taste and odor problems caused by chlorine and chlorine dioxide water treatment chemicals. Multi media filter cartridges can be used to treat a variety of water problems like fluoride, arsenic, scale, corrosion control, nitrate, lead, organics and more. Backwash tank based systems can use either a single medium or multiple media based on what it is engineered to filter. Our CCMG seld-cleaning filters contain a bed of high active catalytic catalytic carbon and a media guard filled with KDF process media. Cat carbon reduced chlorine, chloramine and organic contaminants in water while the KDF redox media removes water-soluble cations (positively-charged ions) of lead, mercury, copper, nickel, chromium, and other dissolved metals. NextSand filters reduce sediment and turbidity in water ; Katalox light filters reduce iron, manganese and hydrogen sulfide (rotten egg smell) in water ; NTO filters with nano titanium oxide reduces arsenic and heavy metals in water. What service flow velocities are possible? Please vist the equipment web page for a service flow and backwash flow chart or contact a WECO support professional. Where should a whole house filter be installed? Cartridge filters should be installed after the pump or water meter. 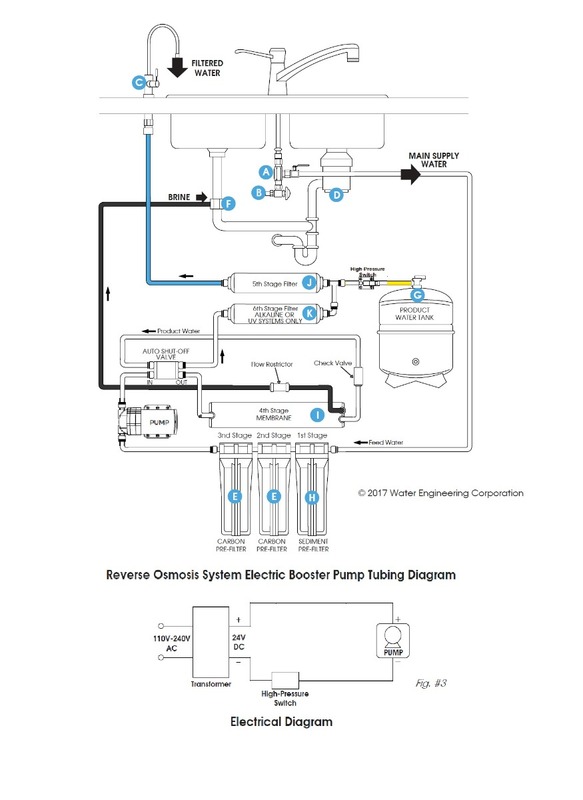 For backwash filters, make sure the installation location meets following requirements. Water pressure and flow rate are sufficient to support backwash. There is an adequate drain for maximum total volume produced during the regeneration cycle and can be used with an air gap device per local plumbing codes. There is an electrical outlet to connect the control head transformer. Does the cartridge filter or filter media ever have to be changed? Cartridge change interval will depend on your water quality and water use. 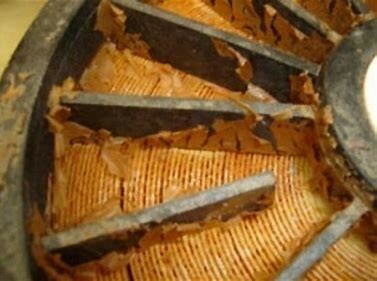 However, in our experience, even a sediment cartridge filter needs to be changed at least every 6 months. Backwash filter media generally last much longer than cartridge filters. However, life of the media will again depend on the type of media used, your water quality, what you are trying to filter and finally your water usage. NEXT sand media is advertised to last 5 year or longer. Katalox light recommended media life is 7-10 years. Catalytic carbon filters typically need media changed every 4-6 years. How can I disinfect a backwash filter? The materials of construction of the modern water filter will not support bacterial growth, nor will these materials contaminate a water supply. During normal use, a backwash filtermay become fouled with organic matter, or in some cases with bacteria from the water supply. This may result in an off-taste or odor in the water. Some filters may need to be disinfected after installation and some filters will require periodic disinfection during their normal life. Depending upon the conditions of use, the style of filter, the type of ion exchanger, and the disinfectant available, a choice can be made among the following methods. These materials are satisfactory for use with polystyrene resins, synthetic gel zeolite, greensand and bentonites. These solutions are available under trade names such as Clorox*. If stronger solutions are used, such as those sold for commercial laundries, adjust the dosage accordingly. A. Polystyrene resin; 1.2 fluid ounce (35.5 ml) per cubic foot. A. Backwash the softener and add the required amount of hypochlorite solution to the well of the salt tank. The salt tank should have water in it to permit the solution to be carried into the softener. B. Proceed with the normal recharge. *Clorox is a trademark of the Clorox Company. Calcium hypochlorite, 70% available chlorine, is available in several forms including tablets and granules. These solid materials may be used directly without dissolving before use. A. Two grains (approximately 0.1 ounce [3 ml]) per cubic foot. A. Backwash the softener and add the required amount of hypochlorite to the well of the salt tank. The salt tank should have water in it to permit the chlorine solution to be carried into the softener. 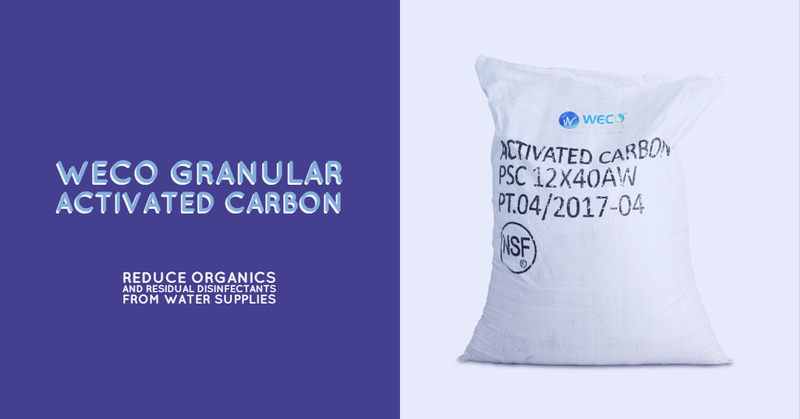 Granular activated carbon is commonly used for reducing organics and residual disinfectants from water supplies. 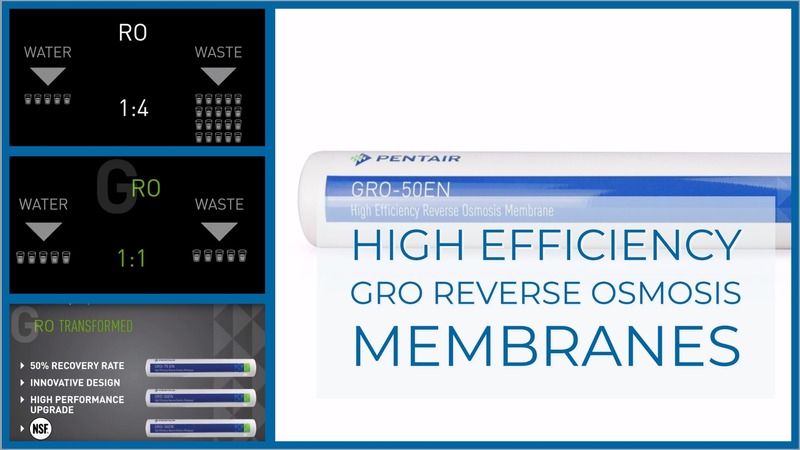 This im-proves taste and protects water treatment components such as reverse osmosis membranes and ion exchange resins from possible damage due to oxidation or organic fouling. Typical surface area for activated carbon is approximately 1,000 square meters per gram (m2/gm). However, different raw materials produce different types of activated carbon varying in hardness, density, pore and particle sizes, surface areas, extractables, ash and pH. These differences in properties make certain car-bons preferable over others in different applications. The two principal mechanisms by which activated carbon removes con-taminants from water are adsorption and catalytic reduction. Organics are removed by adsorption and residual disinfectants are removed by catalytic reduction. While more expensive, catalytic carbon is far superior for the reduction of chloramines and other contaminants. Catalytic carbon can generally be used in lieu of non catalytic carbon. pH : Organics are less soluble and more readily adsorbed at a lower pH. As the pH increases, removal decreases. A rule of thumb is to increase the size of the carbon bed by twenty percent for every pH unit above neutral (7.0). Particle Size : Activated carbon is commonly available in 8 by 30 mesh (largest), 12 by 40 mesh (most common), and 20 by 50 mesh (finest). The finer mesh gives the best contact and better removal, but at the expense of higher pressure drop. Flow Rate : The lower the flow rate, the more time the contaminant will have to diffuse into a pore and be adsorbed. A 20 by 50 mesh carbon can be run at twice the flow rate of a 12 by 40 mesh, and a 12 by 40 mesh can be run at twice the flow rate of an 8 by 30 mesh. 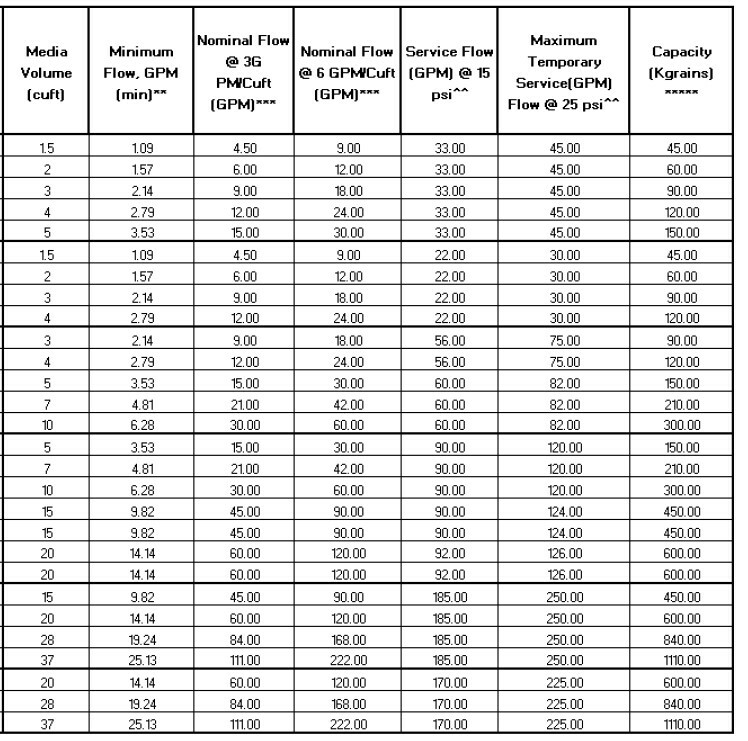 When considering higher flow rates with finer mesh 20x50 carbons, maintain a peak flow of <10 GPM ft2 (5GPM peak for a 10”x54”) to mitigate pressure drop issues. Higher water temperatures decrease the solution viscosity and can in-crease the dye diffusion rate, thereby increasing adsorption. Higher temperatures can also disrupt the adsorptive bond and slightly decrease adsorption. It depends on the organic compound being removed, but generally, lower temperatures seem to favor adsorption. Hardness ≈3 GPG Naturally Deposits Ion Exchange Softening and Various Alternates. Hydrogen Sulfide N/A .05 mg/L Natural Rotten egg taste and odor Iron Reduction Filter, KDF 85, Catalytic GAC, Oxidation or Aeration Followed by Filtration, Replace Magnesium Water Heater Anode with Aluminum or Zinc. Iron 0.3 mg/L Natural deposits Iron Reduction Filter Oxidation or Aeration, Followed by Physical Filtration, Ion Exchange, Special Media (e.g. FerriLite) Filtration. Lead 0-15 ug/L Pollution, corrosion Micro-D, Reverse Osmosis, DI, Special Design Ion Exchange Softener, Special Design GAC Cartridge., KDF. Manganese 0.05 mg/L Natural deposits Iron Reduction Filter Oxidation or Aeration, Followed by Physical Filtration, Ion Exchange, Special Media (e.g. FerriLite) Filtration. Methyl TertiaryButyl Ether (MTBE) 20-40 ug/L Leaking underground gasoline storage tanks. High Capacity GAC, Air Stripping above ≈100 ug/L. pH ≈8.5 Natural and Human Causes Low pH: Calcium Carbonate, Magnesium Oxide, Soda Ash. High pH: Acidify e.g. White Vinegar. SAR (Sodium Adsorption Ratio) <3.0 acceptable for most irrigation. Measure of the suitability of water for agricultural irrigation as determined by the solids dissolved in water. High sodium levels in water can replace calcium and magnesium in the soil causing poor infiltration of water and air. The use of water with a SAR above 3.0 for irrigation needs to be carefully considered or soil/crop damage may result. Silica N/A Natural deposits Reverse Osmosis in conjunction with deionization to remove up to 90%, low levels can mimic hardness. Silt Density Index (SDI) ≈4 at 15 Minutes Suspended Matter, used primarily to predict membrane fouling potential Physical filtration, coagulant, settling tank. No correlation to NTU. *Data herein is provided as a courtesy and is subject to change without notice by IWP. ❐ Impact Water Products. Ontario, California, U.S.A. Available in a nearly limitless number of configurations, contact WECO to discuss your custom blend. Filters come standard in clear color. Quantity discounts available. Filters are individually labeled and boxed or without box and/or label upon request. An extended capacity option is available in white as standard or translu-cent for the 2½” x 9¾” sizes. Filters are individually labeled and boxed or without box and/or label upon request. *Filtration media will react to the influent water chemistry and other factors. Effluent conditions (e.g. pH, hardness, TDS, aggressivity, odor and taste) may be impacted. Recommended peak flow rate and capacities are theoretical estimates only. Actual service flow rates may be significantly lower than the peak flow rate. Your results may vary significantly. Please see media specifications or contact WECO Filters with questions. How often should filters be backwashed? As filtration proceeds, the void areas in the medium become filled with particles removed from the water, resulting in pressure drop from the outlet. Flow rates through the filter medium decreases until it becomes insufficient to meet the demand. A partially clogged filter bed also results in deteriorated water quality. At WECO we prefer backwashing done at least every 4-7 days at 10 gpm/sq.ft and the whole house systems are pre-programed for the self-cleaning cycle to occur at 2.00 AM. One way to make the when-to-backwash decision is to install pressure gauges before and after the filter. Backwashing should be performed when the pressure drop reaches a pre-determined maximum value (typically 15 PSI for whole house systems). Backwash the system on demand by pressing the Regeneration button on the home screen. Manual Regeneration can only be used while the valve is in the treatment position. Please note that a minimum of 20 psi (1.4 bar) of water pressure is required for the backwash/regeneration valve to operate effectively. You must have an air gap on the drain line to prevent back flow of drain water into the system. A 2x the drain line pipe diameter air gap is required with a minimum 1" air gap. How often should softeners be regenerated? 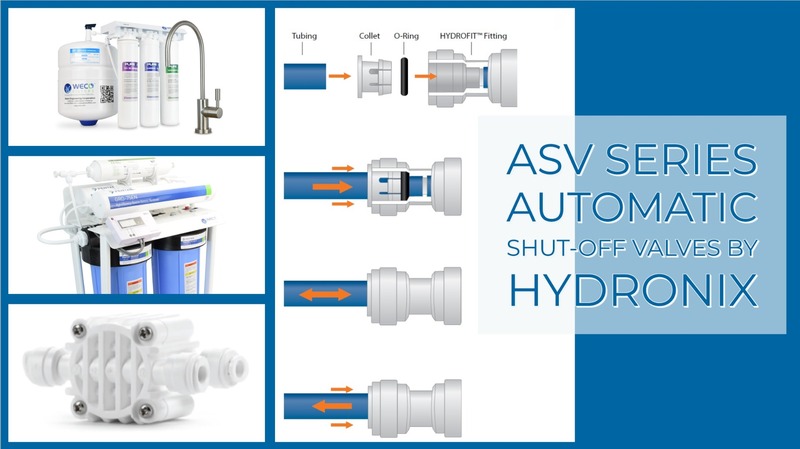 Once you test and enter the hardness level of water in your UXC softener control panel, the automated control valve decides when to regenerate based on the amount of water passed through the softener. Our softeners are programmed to 'Softener Delayed' regeneration type. This means that your softener measures water usage and regenerates the system at the selected Regeneration Time after the calculated system capacity is depleted. The control calculates the system capacity by dividing the unit capacity by the feed water hardness and subtracting the reserve. The reserve should be set to ensure that the system delivers treated water between the time the system capacity is depleted and the actual regeneration time. Reserves can be set at a Fixed Volume, Fixed Percentage of capacity, a Variable Reserve based on the previous calendar day's water usage, or a Weekly Reserve based on the average water usage for the current day of the week. The default for the day override parameter is OFF, and the default reserve type is Weekly Reserve. A Softener Delayed control will also start a regeneration cycle at the selected Regeneration Time (2:00 AM default for softeners, 12:00 AM default for filters) if a number of days equal to the Day Override pass before water usage depletes the calculated system capacity. If the regen type is changed from Softener Immediate to Softener Delayed (or vice-versa), all parameters within those types will be reset to factory default. 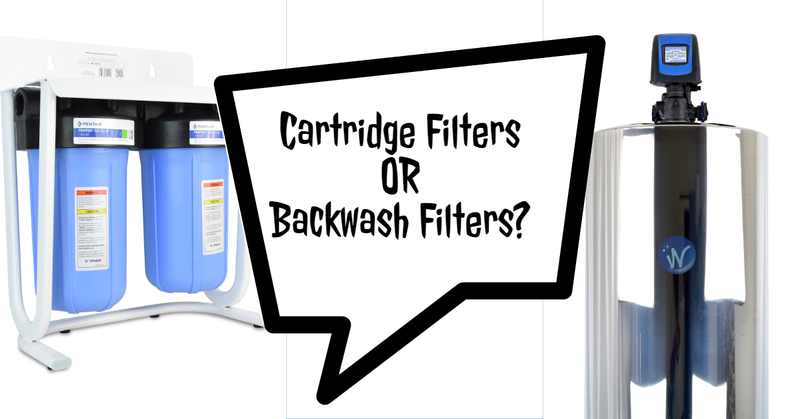 Where should a softener/backwash filter installed? Make sure the installation location meets following requirements. Water pressure and flow rate are sufficient to support backwash/regeneration. Does the filter media/resin in filters ever have to be changed? Media life will depend on the type of media used in your backwash filter. NEXT sand is advertised to last 5 year or longer. Katalox light recommended media life is 7-10 years. Catalytic carbon filters typically need media changed every 4-6 years. A water softener resin bed normally lasts 5 to 10 years. How can I disinfect the filter/softener? The materials of construction of the modern water softener will not support bacterial growth, nor will these materials contaminate a water supply. During normal use, a softener may become fouled with organic matter, or in some cases with bacteria from the water supply. This may result in an off-taste or odor in the water. Some softeners may need to be disinfected after installation and some softeners will require periodic disinfection during their normal life. Depending upon the conditions of use, the style of softener, the type of ion exchanger, and the disinfectant available, a choice can be made among the following methods. Why do I need a water treatment specialist? Wont some equipment from the store work just fine? When it comes to water treatment there is no turnkey solution that works for all water sources. The water that is supplied changes throughout the planet while also changing with the seasons. So there may be a setup in New York that works really well on their water source but it might not work well in California. Each water treatment system needs to be adjusted for based on the water that will be processed within the system. So if we want to find the perfect equipment to process our water we need to find a way to figure out what’s in the water. This is where a water sample should be obtained and sent in for analysis. City Water vs Well Water? A water analysis is important so a water treatment professional can assist you in what you need to do to treat your water. When it comes to your water sources, the two most common are well water and city water. When people are not in largely populated areas with no good way of getting city water, they usually have to use well water from their land. Well water is more cost effective as it is being obtained from land the customer owns. However, since water is a universal solvent it will obtain particles and compounds it comes into contact with. So as you can imagine, when you have a large well underground it will dissolve minerals, salts, and many other materials in the ground. Depending on where you live the composition of what’s in your well water depends on the ground beneath your feet. It also depends on what else can get into the water from nearby areas. We have all heard stories of ground water and well water being tarnished by chemicals from nearby businesses. So it is good to ensure your water is safe for consumption. This can be done by obtaining a water sample and sending it to your water treatment professional. He can tell you what you need to get the best water for your home or business. Now well water might be different as its coming from the land and has no way of ensuring consistency. But city water that customers pay for has to comply with EPA standards. If they do not ensure the water they are providing is safe and complies to EPA standards, then the city would face costly lawsuits from customers they have affected. If you are ever curious about what is within your city water, the city is required to keep records of tested samples on a regular basis and make them publicly available to their customers. So as you can imagine to avoid those lawsuits they build large industrial water treatment plants to treat the water for their customers. Then they use large pumping stations to pressurize the water to get it out to the customers pipelines. Will my water change and should I get it tested multiple times? So depending on whether you use well water or city water you will face different obstacles. With city water, you are at the mercy of what the city provides to your pipes as to the water you get. The city most often obtains water from surface water sources. This provides different challenges as the water composition will change throughout the year as the weather changes. Well water however, being deep underground, will not change as easily with the weather as it goes unaffected by the changes at the surface. But well water will change as it obtains more from its surroundings or anything that may get into the water from contamination. So this begs the questions how often should we test our water to ensure we are treating it properly? For city water, since it will change with the weather it is best to at least test it 3-4 times a year. Then for well water it would be good to test it 1-2 times a year to ensure nothing has tarnished it or change it in some way. Why should I get a lab test when I can get a field test? When it comes to testing there is very precise laboratory tests and then there are somewhat precise field tests. The laboratory tests can be done to determine the exact ppm of all the elements and compounds in the water. This is the preferred test when determining the proper equipment to treat the water, but sometimes when there is something that has changed and is affecting your water a lot very suddenly then field tests are good to determine what can be altered to ensure optimum water quality. These are usually small titration kits where a certain amount of water needs to be measured out and then the titration packets need to be added to determine how much of the measured compound is in the water. Some examples of field test kits are kits that test for free chlorine, total chlorine, and total hardness. To properly obtain a sample, a sample bottle (which the water treatment company can provide) will need to be used. These bottles keep from contaminating the samples to get the most accurate depiction possible. Then it is best to run water through you sample point for at least 1-2 minutes to ensure it is properly rinsed and will accurately present what’s in your water. The sample bottle needs to be filled to the rim and then sealed. The bottle then need to be sent to your water treatment professional so they can have laboratory tests done. Once the tests have been done, the lab will break down the results and provide a document that tells you exactly what’s in the water. These results can then be used to determine what you would need to process your water properly and ensure you always have good water in your house or business. An example of the document you will be provided from the lab would be like the one provided in figure 1. Figure 1: Example of the first page of a laboratory water sample test. 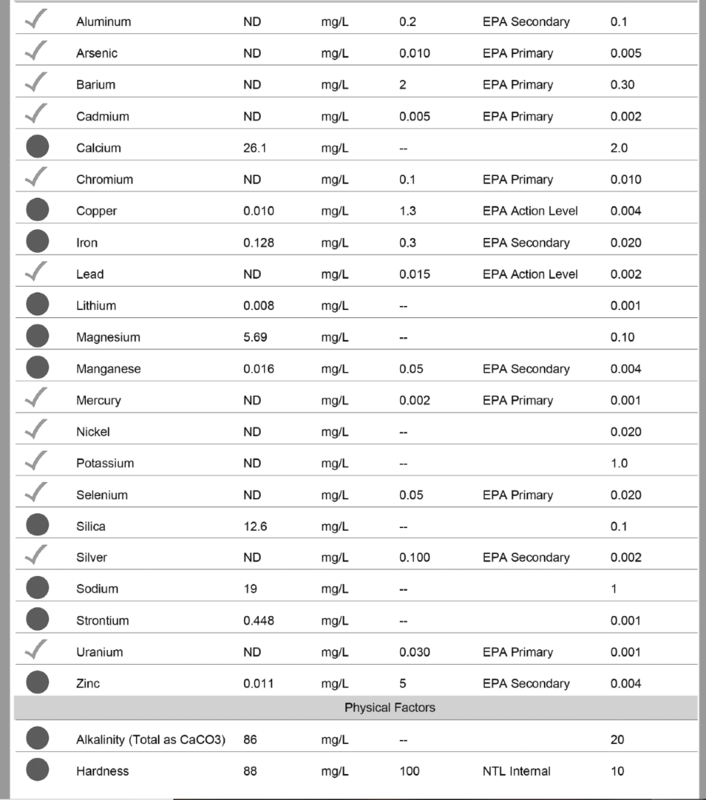 Gives a breakdown of the ppm value for many elements and compounds. Entire water treatment process or point of use treatment? Now when it comes to how to treat your water, you can treat the entire house or just one point of use. An example of this are the refrigerators most of us use today. Many fridges today come with water lines to get cold water from the fridge but they also come with filters on them to slightly treat the water before it gets into your cup. We can apply that same theory across your house. The entire house can have treated water with larger equipment or smaller equipment can be used to treat certain points of use. So it is best to determine with your water treatment specialist if you would like to treat all of the water or if there are specific points of use you need the water treated. You can also apply this mentality to the amount of water treatment. If a activated carbon filter is needed or if one of the points of use need to go through many different pieces of equipment to ensure itgets treated more heavily. It isn’t al all or nothing thing. Different points of use can use more of less treatment based on your needs. With all this information it is best to consult a water treatment specialist? Now that we know we have different water sources, that can change throughout the year, the different tests that can be used and how much we can treat our water. How are we to determine what needs to be done? Well as you can imagine it would be hard to use all of this information to put together a solution to treat our water. It is much better to consult your water treatment specialist to determine what equipment you need to ensure you get the best water possible. They can help you throughout the entire process to be sure you are taken care of and that you have the best water for your family or business. 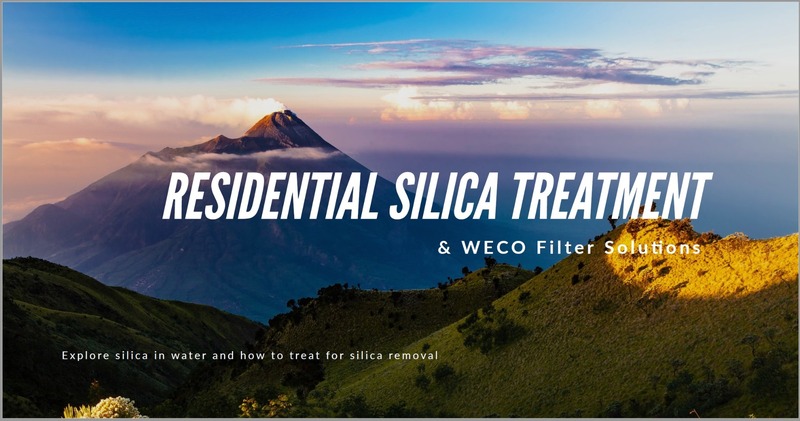 This article is going to explore silica in water and how to treat the water for silica removal. Silicon dioxide is one of the most abundant compounds on earth and having such a high amount of it makes for no surprise that nearly all water contains colloidal and dissolved silica in solution unless it is treated. Silica is a glassy mineral substance that comes in a variety of forms. It is problematic because of its tendency to form deposits and scale. There are studies done by quite a few sources as to the effect of silica exposure for long periods of time but that is for another topic. Essentially, we want to remove the silica that occurs in our water for the multitude of uses we have for that treated water. Most sources contain 5-25 ppm of silica in solution with some areas, usually well water, that have as high as 100 ppm of silica or higher. So how can we help you understand silica and how to remove it? Below we will discuss silica and the water treatment methods that we need to use to remove the silica for our use. Before we speak to how to remove silica from our water we should discuss how it appears in our water. The first method is dissolved silica. From contact of the earths water with sand, quartz, granite and other earthly methods, water dissolves silica and it remains in solution until removed. The second method is known as colloidal silica. Colloidal silica refers to the silica the doesn’t dissolve in solution and instead stays suspended within water. Unlike other heavy larger materials, silica will not settle to the bottom of the container to be removed. Even given an infinite amount of time, this colloidal silica will stay suspended in the water without ever settling out. To remove these, we will need to use reverse osmosis (here forth referred to as RO) and strong base anion ion exchange resins (hereforth referred to as SBA). As a recap to other articles, RO is the process of applying energy in the form of pressure to reverse waters tendency in nature to balance dissolved particles across a semi permeable membrane. This tendency moves water from areas of different concentrations to balance them. To reverse this process, we apply pressure to the highly concentrated side to “push” the water across the membrane to produce clean water and leave behind the unfavored materials we want to remove. Silica is one of the materials that is removed by an RO unit. The percentage removal of silica by an RO unit depends on some conditions. One of the largest conditions is the pH of the water. Silica has better removal when the pH of the feed water is high. One disadvantage of having high pH feed water is the fact that the calcium and magnesium that is dissolved in water will react with carbonate to create a crystalline substance known as scale that will plug the membranes. This scale will cost a lot of money to clean off the membranes to continue to produce clean water. To prevent this, we need to inject antiscalant to prevent scale from forming and plugging up our membranes, so we can ensure a longer production life of the membranes. Using an RO at high pHs we will see a removal of silica by up to 95%. But to get that small amount that passes through the RO unit we need to use other methods of removal. The next method to remove silica from water would be through ion exchange resins specifically strong base anion exchange resins. At WECO Filters, we use Purolite A400E resin to treat silica in water. SBAs like the A400E remove all anionic contaminants present. One such contaminant is the silica in solution that will be acting as a weak acid after the RO. The beads will release hydroxide to the water and bond strongly to the silica in solution. There is only so much the resin can bond to the silica before it has no more than it can remove because the resin has been exhausted. When this happen we need to regenerate the resin with caustic soda so that we give such a high concentration of hydroide we can force the reaction of the resin to bond to silica but in reverse. This will remove the silica concentrations down to the ppb level and leave the water with very few contaminants and properly treat the water to the point we would all the like the water to be for our residential use. By providing an RO unit with antiscalant injection and a strong base anion ion exchange resin, the water will be treated to remove almost all the silica in the water to avoid the troubles of silica deposits and scale that can be problematic to residential uses. The article will aim to help assist you in the understanding of determining the water processing equipment you may need while also providing clarification on some of the small details within determining the correct equipment and chemicals to use within your house or place of business. To first begin we can discuss why water processing is so important. I don’t have to tell you the importance of water as it is used from everything from drinking water or consumable products, to use within energy systems, boilers and many other applications. The one trouble however that water poses is that it is a universal solvent. It has the ability to dissolve many different chemicals or substances. Now depending on the substance, it may dissolve more or less but most things dissolve in water to some extent unless hydrophobic in nature. This poses a problem because there are many things we don’t want in water if we are to use it. Most everyone would not like to see slime or dirty water coming out of their faucet when they fill a cup to drink. But sometimes it’s the things we cannot see or know in water that are also dangerous. But for consideration of water processing units at a residential level it’s good to consider the different types of inlet water sources. The most common inlet water source to most people is city water. The water you get that is processed by the city for our use. They do some amount of processing but sometimes it’s not to the levels we would prefer. They tend to get big suspended solids out of solution using flocculation, a method of binding big undissolved solids basically into a large ball then letting gravity drag that ball of material to the bottom of a separation tank for removal while the better water flows further into the system. City water processing is something similar to figure 1 below. Figure 1: Large reservoirs for the purpose of removing large suspended solids. However, the city doesn’t go to lengths to remove everything. They always have certain ppm regulated limits of substances and chemicals that if they stay under they can provide that water without getting fined. So let’s discuss what we as a consumer can do to help in our own way to provide water processing so we always have good water to use for ourselves that isn’t dependent on the city. So, when considering what is needed within our system to process water it’s good to know what is in the water that isn’t preferred. To do this it is good to take a sample of water in a clean bottle and send it out for analysis. They are usually a few labs in every state that can do a water analysis and provide you a breakdown of everything in your water. But we are concerned about a few key attributes. Because at the heart of a good water processing system is usually a reverse osmosis unit which we will call an RO for the rest of the article. It does the brunt of the work and needs the proper pretreatment to keep it in good working condition. One major material we are concerned with is hardness. If you are like me, I am in an area that has very high hardness in the water. This means the water has lots of calcium and magnesium in the water. 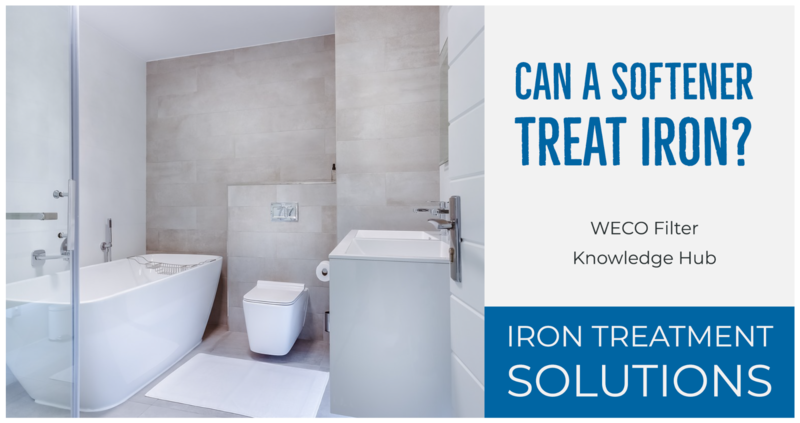 You can usually see hardness scale on your glass shower doors because as you take a shower and the water that splashed on the door is dried it leaves behind the dissolved material in the water and the usually culprit is calcium and magnesium. These substances cause trouble because another common material in water is carbonate. When you combine these materials to make things like calcium carbonate, it can scale your RO and require further expensive maintenance to continue processing your water. Scale is essentially any substance that can precipitate out of the water to form an undissolved substance that will essentially clog your RO. A picture of calcium carbonate is below in figure 2. As you can see the membrane has lots of material that precipitated out of solution and has deposited that material all over the membrane. The water has to flow in those small spaces between the rolled-up membrane to be able to process the water. When it gets all clogged up you can imagine how much harder it will be to process that water. So, to avoid this headache of scaling your membranes because of the hardness in your water. If you do live in an area with high hardness it is good to get a water softener. 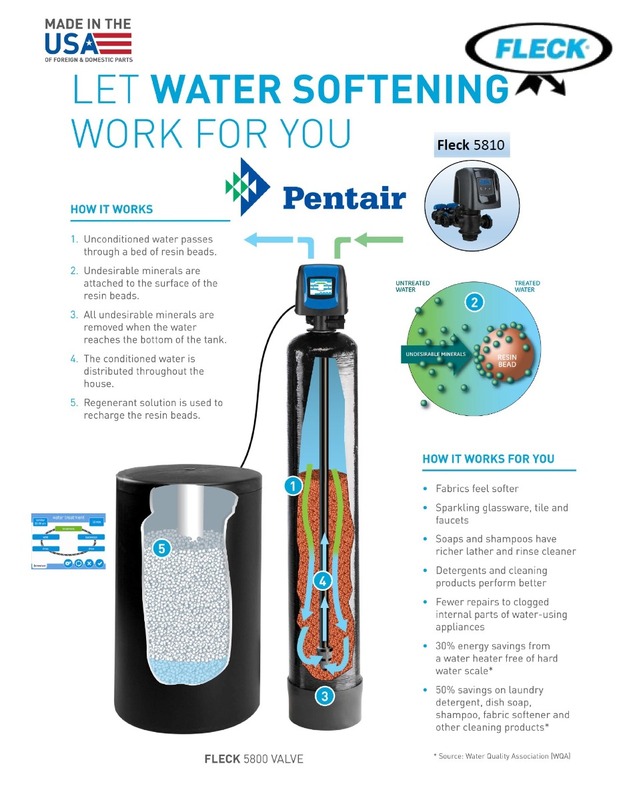 A water softener is a vessel with resin that is aimed at removing positively charged ions like calcium and magnesium and holding them on the resin bead. In exchange the softener resin discharges sodium in its placed which cant scale a membrane. But as you can imagine there’s only so many ions of calcium and magnesium the resin can take before its overloaded. So, we do have to regenerate the resin when it gets all used up. We do this by providing it a high concentration of brine (salt water) to replace the resin that has remove calcium and magnesium for sodium again. The whole process of water softener is to trade sodium for calcium and magnesium, regenerate the resin to put sodium back onto the beads and then do that process all over again. By doing this water softening we are getting rid of the chance for the membrane to get clogged with scale and require cleaning the membrane or replacement of the membrane. Some cities however don’t allow discharge of highly concentrated brine. So, if you need a softener but the city permits you from doing so we have another option. This option is a chemical known as antiscalant. It is a substance that when dissolved in solution at the proper PPM that it will not allow the scale to form while you process the water. This assists in processing the water while not scaling the RO unit and not discharging highly concentrated brine to the city water system and getting fined in the process. There is some water processing software out there but to avoid the headache of doing the software simulation, it is best that if this option is needed to work with your chemical provider of the antiscalant for the proper dosage rate. Another form of pretreatment to an RO is known as an activated carbon filter. This activated carbon resin is essentially a carbon rich material that was treated with very high temperature steam. When doing so it made the substance very porous. This porous resin can trap substances in those small holes made in the resin. This assists in many efforts such a removal of total organic carbons (TOCs) like urea, chloramines, chlorine, silica and many others. But for the purpose of pretreatment, the most pronounced removal that is favored is the removal of chlorine. Chlorine is unfavorable for ROs because it can react with the membrane to essentially punch holes in the membrane. As you can imagine when you punch holes in something it won’t remove everything it needs to and will let unfavorable substances through the membrane. But this is also a trouble because chlorine is used as a biocide. It helps avoid any biological growth in the water that could make the water unusable for residential use. But since most residencies use their water daily and many times per hour. The water won’t be sitting long enough to grow any biologicals so usually it isn’t too big of a trouble to remove the chlorine since water will always be running in your house. Lastly, we will cover the bread and butter of a water processing system, the reverse osmosis system. To cover reverse osmosis, it would first be good to understand what osmosis is. If we refer to Figure 3 below we can explain this picture and understand the processes of osmosis and reverse osmosis. Figure 3: Illustrates a ubend of a pipe with the bottom of the ubend having a semi permeable membrane. The left picture is without a piston for pressure and the right has a piston to provide pressure. If we look at the above picture we can explain osmosis and reverse osmosis. 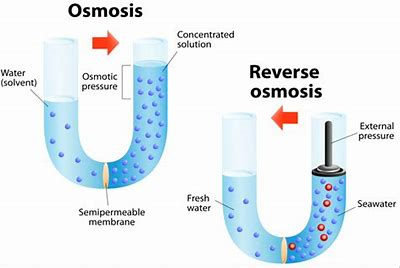 Osmosis is the nature of water to move across a semipermeable membrane (semipermeable meaning it only permeates a few substances but not all) in an effort to balance the number of dissolved solids in solution. Nature always moves towards balance and it can be seen here. However, since we want clean water we can do the reverse process. By applying pressure which is shown at the right part of the picture with a piston, we are able to apply energy to the system and push the water through the membrane to make clean water and discharge the dirty water. It is very important to remember RO does require that we discharge some water. We have to have water that will contain the dissolved solids, or the RO will have lots of scale on it just like your shower door. If we produce all the water to product and leave none as concentrate, all those materials that we wanted to get rid of will instead either be forced through the membrane and still end up in the water or it will eventually reach its saturation limits in water and start precipitating out of solution and scaling the RO. It is very important to discharge the small amount of water we need to so we can ensure our unit last a long time with little to no maintenance. Now that we understand that we can apply energy in the form of pressure and perform reverse osmosis to make clean water we can apply this on a bigger level. As you saw earlier the RO unit isn’t a u-bend. They make fully contained membranes that we saw in figure 2 that go into pressurized vessels and produce clean water. Instead of having a small part of a semi permeable membrane. We make big sheets of them and roll them up. Then water flows next to the membrane and due to the pressure, it permeates the membrane and flows around the rolled-up membrane to product and can be used when it comes out as product. 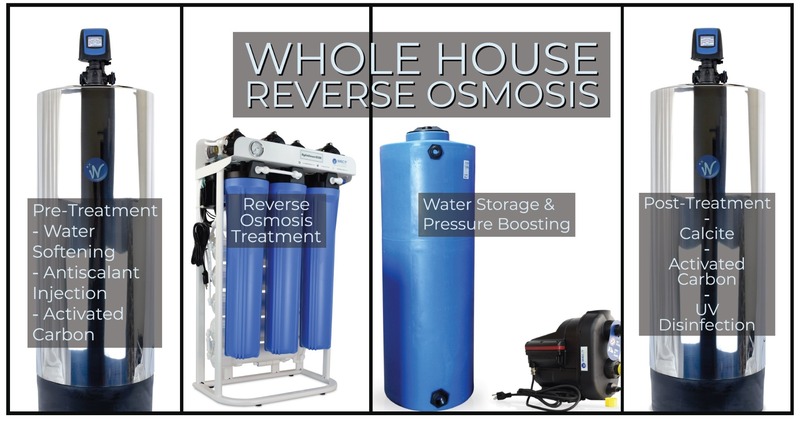 A reverse osmosis unit rejects many types of materials that are unfavorable in water and is the best form of treating water for residential use. I can’t make a list of all the substances it rejects because it would make a list with as many words as I have already written but it will give good clean water for your use. To recap, we have covered that we can use a softener to remove calcium and magnesium to protect and RO from becoming scaled. If we are unable to use a softener that we can get the chemical called antiscalant and inject it into the water to stop from having high hardness water scale the RO. Remember the correct dosage rate can easily be determined by the chemical provider so let them help you by providing them with your water analysis. We also can use an activated carbon filter to remove the chlorine and other materials to protect the RO membranes. Then we can finally process the water with an RO to get very clean water out for our residential use. If you want to learn more about water processing read more articles provided for education on water processing. Below I have provided tables to size tanks for softeners and carbons filters. 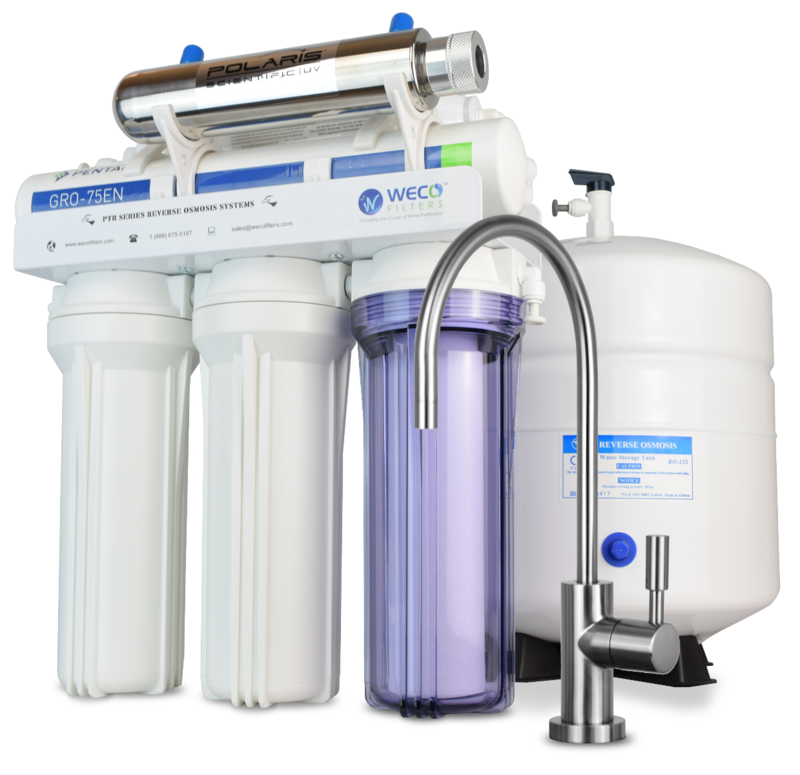 To get a better picture of the filtration systems available for your water analysis, I encourage you to visit wecofilters.com and get in touch with a WQA certified water specialist. Consultation is free to all customers. Matt Peiris is a senior application engineer for WECO Filters. He can be reached at matt@wecofilters.com. Is Nanofiltration Right for Your Industrial Application? According to a report published by the United Nations, clean water sources are under increasing pressure as global population increases. In turn, many industrial facilities are under pressure not only to treat the water they need to operate, but also to reduce overall water consumption. Nanofiltration can help industrial facilities filter water, soften water, and generate potable water while helping to save energy and valuable industrial space. Nanofiltration is a relatively new semipermeable membrane filtration system that was designed primarily for drinking water purification. It works on the principles of reverse osmosis, but it is different from the reverse osmosis systems used for seawater desalination and other water purification applications in that nanofiltration uses lower-rejection membranes. It exists in the gap between reverse osmosis on the higher-rejection side and ultrafiltration on the lower-rejection side. As the name suggests, nanofiltration membranes typically separate particles around one nanometer in diameter. Reverse osmosis and nanofiltration use similar technology—the opposite of osmosis. During osmosis, dissolved solvents move from an area of higher concentration through a semi-permeable membrane into an area of lower concentration. This happens spontaneously; the solutions on both sides of the membrane try to equalize their concentrations. In reverse osmosis, however, the particles dissolved in the water need to be removed. So, the water on one side of the semipermeable membrane must be forced across. Unlike microfiltration and ultrafiltration, nanofiltration and reverse osmosis can deliver consistently filtered water without the use of coagulation, no matter what the quality of the feed. A major benefit of using nanofiltration is energy savings. In contrast to reverse osmosis, the larger pores in nanofiltration membranes often require less pressure in the purification system. Pressures in reverse osmosis systems range from about 75 psi to as much as 1,200 psi. Nanofiltration systems, on the other hand, have typically lower pressure requirements of approximately 50 psi to 225 psi. In some cases, nanofiltration’s lower pressure requirements can save up to half the energy used for water filtration. Additionally, nanofiltration takes place at ambient temperatures, so it does not demand heating and cooling like distillation. The larger membrane pores used in nanofiltration allow more salt into the permeate. In nanofiltration, sodium chloride rejection rates can be as low as 75-80% (and maybe even as low as 40%), while reverse osmosis systems generally reject at least 99.5% of sodium chloride. In many facilities, however, the lower salt rejection rate will be more than acceptable when coupled with nanofiltration’s lower energy use. In facilities where scaling is a concern, nanofiltration can be an attractive option because its membranes tend to retain calcium and magnesium ions, resulting in soft water. Even as salt rejection rates go down, nanofiltration systems often retain hardness rejection rates of 90% or more. In addition to energy savings and water softening benefits, nanofiltration systems usually have a much smaller footprint than traditional, multistage separation options. The membranes used in nanofiltration systems often need to be hundreds or even thousands of square meters. For efficiency, they are packed in modules. Most often, nanofiltration systems use spiral wound modules, in which flat membranes are wound around a tube. Many standard nanofiltration systems accept 2.5-, 4-, and 8-inch diameter spiral wound modules. These membranes tend to require little maintenance, though they can be susceptible to buildup of material that can block, or foul, them. Fouling can usually be mitigated by additional filtering upstream, by adding coagulants, or chemical solutions designed to destroy biological contaminants which can flourish in the temperatures where nanofiltration often takes place. Though nanofiltration has a number of benefits, it may not be the best option in zero liquid discharge situations. Like reverse osmosis, nanofiltration creates a fairly large volume of wastewater—which can be up to half of the feed volume. Some facilities may opt to use evaporations ponds or injection wells to avoid discharge. Nanofiltration systems are versatile and cost-effective ways to deliver the water many industrial facilities need to operate. They are worth exploring when designing industrial water purification systems. Pure Aqua, Inc., “Nanofiltration NF Systems,” https://www.pureaqua.com/nanofiltration-nf-systems/. The Dow Chemical Company, “FILMTEC Membranes,” http://msdssearch.dow.com/PublishedLiteratureDOWCOM/dh_0042/0901b80380042dd2.pdf?filepath=liquidseps/pdfs/noreg/609-02002.pdf&fromPage=GetDoc. 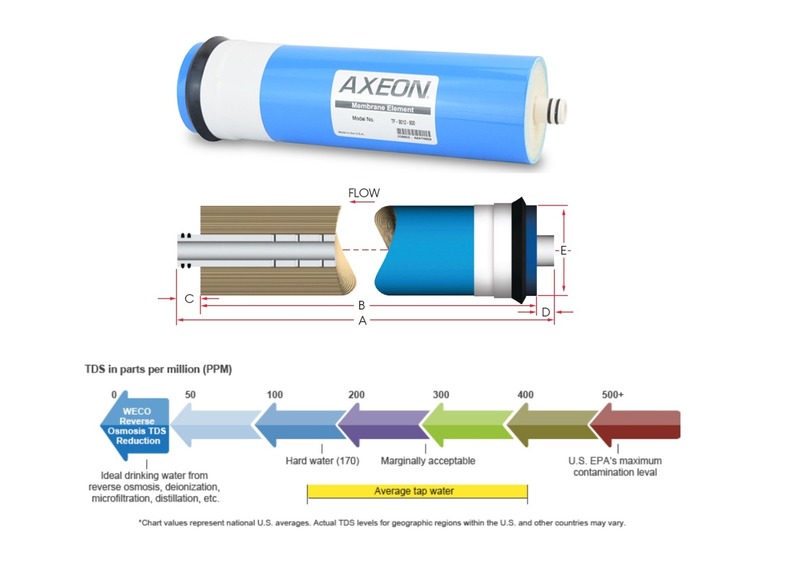 AXEON Water Technologies, “AXEON Introduces Nanofiltration Water Systems for Industry Use,” https://www.axeonwater.com/blog/axeon-introduces-nanofiltration-water-systems/. SAMCO Technologies, A Fundamental Guide to Industrial Reverse Osmosis and Nanofiltration Membrane Systems. https://www.samcotech.com/. Polaris Scientific Ultraviolet Systems have fast become a product of preference for water treatment professionals globally. Polaris Scientic UV Sterilization Systems are sleek, compact, durable, cost effective systems that provide an exceptional value to consumers worldwide. Polaris Scientific is proud to announce that our UV Series line of sterilization systems is now in the process of being replaced by our new UVA Series line which has the added benet of Polaris Scientics New Patented 4 Pin Germicidal Lamp design. The new patented staggered 4 Pin design will be exclusive to Polaris UV customers and will not be available elsewhere. This new lamp pin configuration will provide an added benefit to our worldwide network of distributors and OEM’s in their service calls and replacement part business. 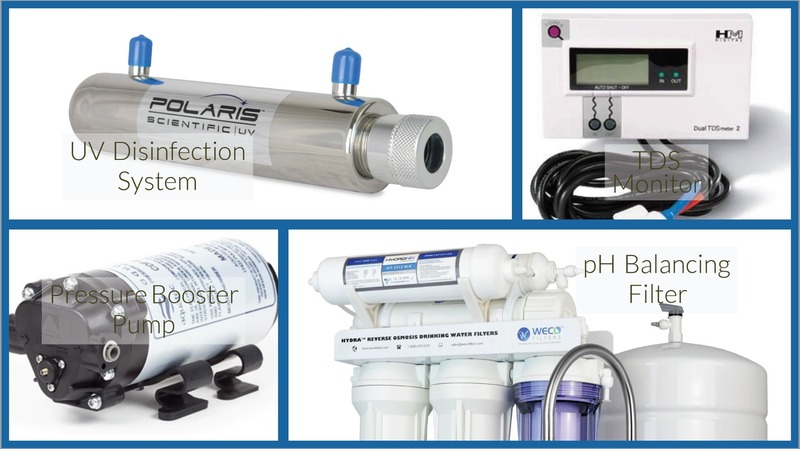 WECO Filters is an authorized distributor of Polaris UV and UVA disinfection systems and parts. 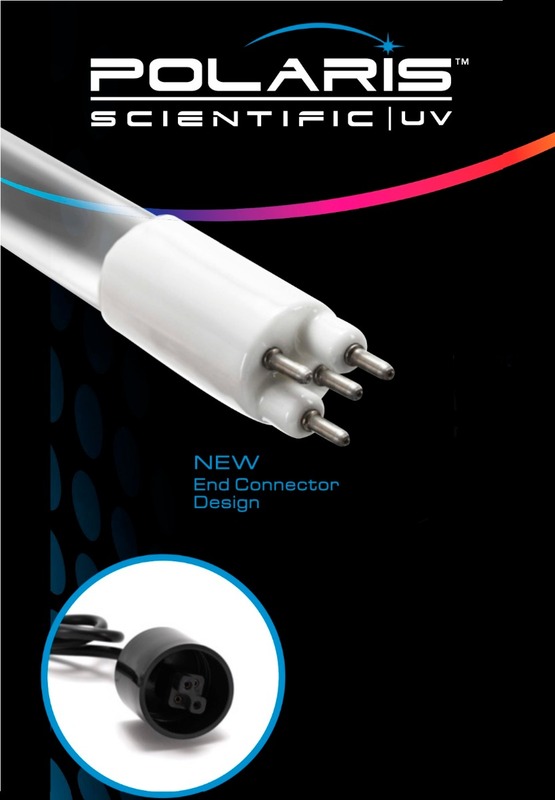 The UVA Series connector cup design allows for a fast secure connection from the ballast to the lamp. No special tools are needed for the installation and it makes maintenance fast and easy. The heavy duty wire and connector connect easily to the lamp and the cup design hermetically secures and holds the connection in place. Both Lamp and Ballast will provide all the benefits of the new Patented design. The Polaris Scientic UVA Series Germicidal Lamp Pin Design is patented under United States Patent Number: D751506 and is protected by U.S. Patent and Trademark Laws. Polaris UV to UVA lamps and ballast. Contact WECO Filters for assistance with your parts for your Polaris UV system. 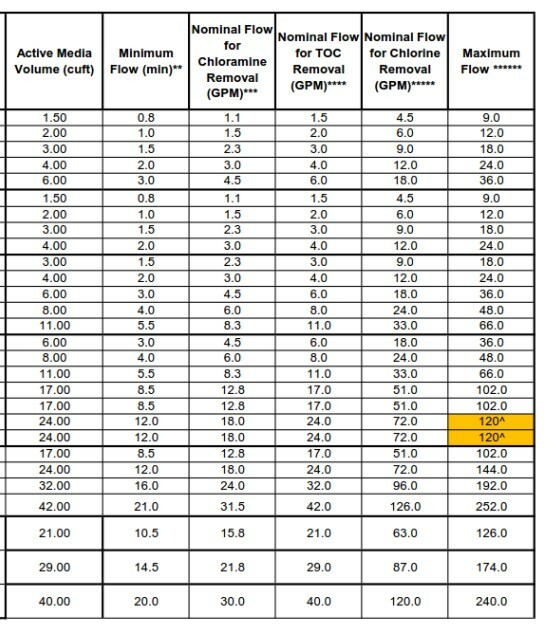 Nominal rejection performance table below is extracted from Water Quality Association knowledge base for standard thin film composite reverse osmosis membranes operating at operating at a net pressure (feed pressure less back pressure and osmotic pressure) of 60 psi and 77°F water temperature. Performance of ro systems utilizing TFC membranes may be less due to changes in feed pressure, temperature, water chemistry, contaminant level, net pressure on membrane, and individual membrane efficiency. Tank-less RO systems (such as countertop ROs) and ROs with atmospheric tanks produce better overall rejection performance than undersink ROs (or ROs with pressure tanks) due to maximizing of net pressure on membrane. Municipal water supplies are tested at the treatment facility to maintain the mandated water quality standards set by US Environmental Protection Agency (EPA). However, if you own or manage a private well, you should already know that there is no federal or state oversight of your water supply. If you buy or sell the property there may be a requirement to have the well tested. You are responsible for the quality of your well water. All testing, conditioning and filtration is your responsibility. EPA recommends you test your well water supply every year for total coliform bacteria, nitrates, total dissolved solids and pH levels, especially if you have a new well, or have replaced or repaired pipes, pumps or the well casing. Testing laboratories supply their own sample containers and will ship you their sample collection kit once you purchase their service. Use the containers provided and carefully follow the instructions given for collecting, preserving and handling water samples. Samples for coliform bacteria testing must be collected using sterile containers and under sterile conditions. Some procedures require that water runs from an outside tap for several minutes before filling the sample containers. Laboratories may sometimes send a trained technician to collect the sample or to analyze the sample directly in your home. Ask if this service is available, since you may obtain better samples and more reliable test results. Sample Kits from National Testing Laboratories, Ltd. Analysis from the lab will compare tested contaminant levels present in water against EPA Primary and Secondary Drinking Water Standards. Check if total concentrations of cations and anions balance. If they do not balance, there are substances dissolved in water that havent been analysed. 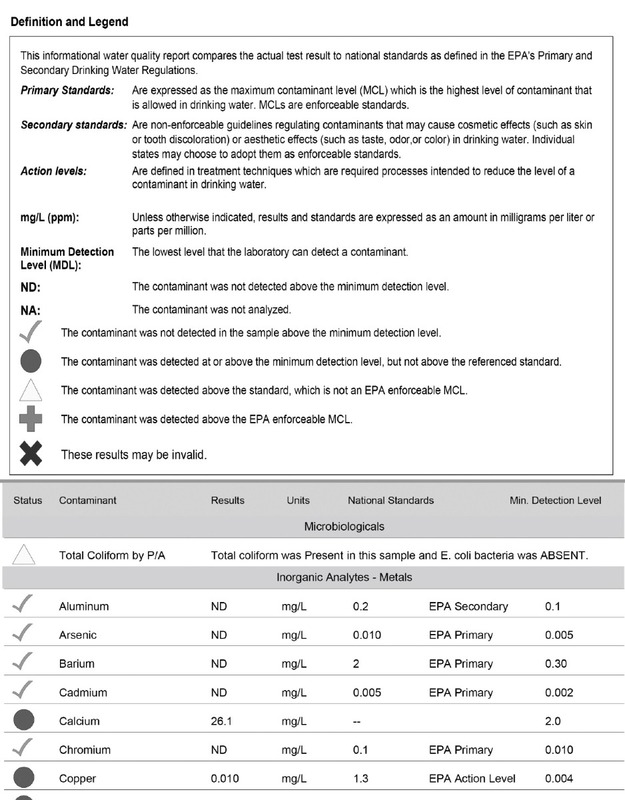 If total dissolved solids (TDS) concentration is higher than anion or cation concentration, water sample contains dissolved substances not included in the report. Epa.gov. (2005). Home Water Testing. [online] Available at: https://www.epa.gov/sites/production/files/2015-11/documents/2005_09_14_faq_fs_homewatertesting.pdf [Accessed 30 Apr. 2018]. "WaterCheck™ Lite." Watercheck. N.p., n.d. Web. 30 Apr. 2018. Water Quality Association ANAN Kowledgebase Administration. Web. 15 Apr. 2018. If you’re health-conscious you’ve heard about the benefits of drinking alkaline water. Independent research is beginning to verify a link between drinking alkaline water and health benefits. At Montana State University, Dr. Dan Heil discovered that drinking alkaline water is beneficial to our health. Dr. Heil conducted an experiment comparing blood characteristics of people who drank alkaline water versus a group that consumed non-alkaline water. The test group that consumed alkaline drinking water had measurable increases in urine and blood pH during the second and third week of the experiment. Dr. Heil also found that the alkaline test group had higher levels of hydration. These positive changes reversed after the group started drinking non-alkaline water during the fourth week. The health benefits were observed only when alkaline water was consumed regularly. Our bodies try to maintain a neutral pH because it makes biochemical reactions run smoothly. However, our diet and certain diseases can tilt the pH balance to the acidic range. It was reported in the Journal of Food and Drug Analysis (2012), that alkaline water helped reverse ultraviolet radiation damage to the skin. It also improved the immune response and even made controlling of diabetes easier. The benefits of drinking alkaline water continue to be confirmed by scientific experiments. The Journal of the International Society of Sports Nutrition (2016) reported that drinking alkaline water after hard work or exercise rehydrated the blood better than regular water. The test measured blood viscosity as a way of measuring rehydration. Drinking alkaline water improved recovery and rehydration significantly better than non-alkaline water. How does alkaline water improve health? The human body functions properly with a neutral blood pH. Finely-tuned biochemical reactions are pH-dependent. pH regulation is a critical, self-regulating mechanism our bodies work at every second of every day. For example, we expel carbon dioxide to reduce the acidification of our blood. Alkaline water benefits out body by neutralizing acids that are linked to premature aging, acne troubles and skin damage due to exposure to the sun. Alkaline water appears to reduce harmful free radicals and inhibit the aging process. Many people claim they have better skin tone and a more-healthy look to their face. Drinking alkaline water appears to aid in the break-down certain fat cells, assisting with weight loss. Although more research is needed, tests seem to show the anti-oxidant properties of alkaline water may even decrease the chances of certain cancers. Japanese researchers, in the journal Trends in Food Science & Technology (2012), believe that alkaline water reverses the negative “reactive oxygen species” associated with cancerous cells. Other tests indicate alkaline water helps in maintaining natural lubricants needed to keep muscles and joints working smoothly. Making alkaline drinking water is easy with WECO reverse osmosis water filtration systems. WECO alkaline reverse osmosis systems include a special acid-neutralizing cartridge will provide a consistent, reliable source of purified, healthy alkaline drinking water for you home, business or anywhere refreshing alkaline water is desired. The WECO HYDRA-75ALK Reverse Osmosis Drinking Water Filtration System with pH Neutralizer Cartridge removes a variety of water contaminants including rust, sediment and sand along with taste and odor problems caused by chlorine disinfectants. Organic chemicals like solvents, gasoline derivatives and carcinogenic disinfection byproducts are adsorbed by the activated carbon solid block cartridge. The reverse osmosis filter strips out heavy metals including cadmium, lead and copper along with nitrate and fluoride. The reverse osmosis process lowers TDS and slightly lowers the pH. The pH neutralizer cartridge automatically raises the pH and adds calcium to the purified water. A final activated carbon polishing filter ensures the water is clean, clear and refreshing. The filtration system comes complete with pure water dispensing faucet and an under-counter water storage tank. If you have a well, are concerned about parasites and bacteria contamination or want the most complete under-counter RO water purification system, the WECO VGRO-75ALK High Efficiency Reverse Osmosis Drinking Water Filtration System with pH Neutralizer Filter is right for you! This RO system removes up to 99% of water contamination. The VGRO-75ALK removes particulates like grit, mineral oxides, and insect fragments along with chlorine disinfectants. A second 0.5-micron Pentek® CBC-10 carbon block filter further removes chloramine, bad tastes and odors, pesticides and carcinogenic impurities. The reverse osmosis system removes salts, heavy metals, nitrate, fluoride and lead. The pH neutralizer cartridge automatically raises the pH and adds calcium to the purified water. A granular activated polishing post-filter ensures great-tasting water. The last stage is ultraviolet (UV) disinfection with a Polaris Scientific UVA-1C disinfector. The UV light kills and inactivates bacteria, parasites, algae and other microbial contamination. The filtration system comes complete with pure water dispensing faucet and an under-counter water storage tank. The WECO TINY-150ALK Compact Undersink Reverse Osmosis Water Filtration System with pH Neutralizer Filter is designed to fit into tight spaces such as under the sink, in RVs, campers and other spaces that won’t accommodate a full-size water purification system. 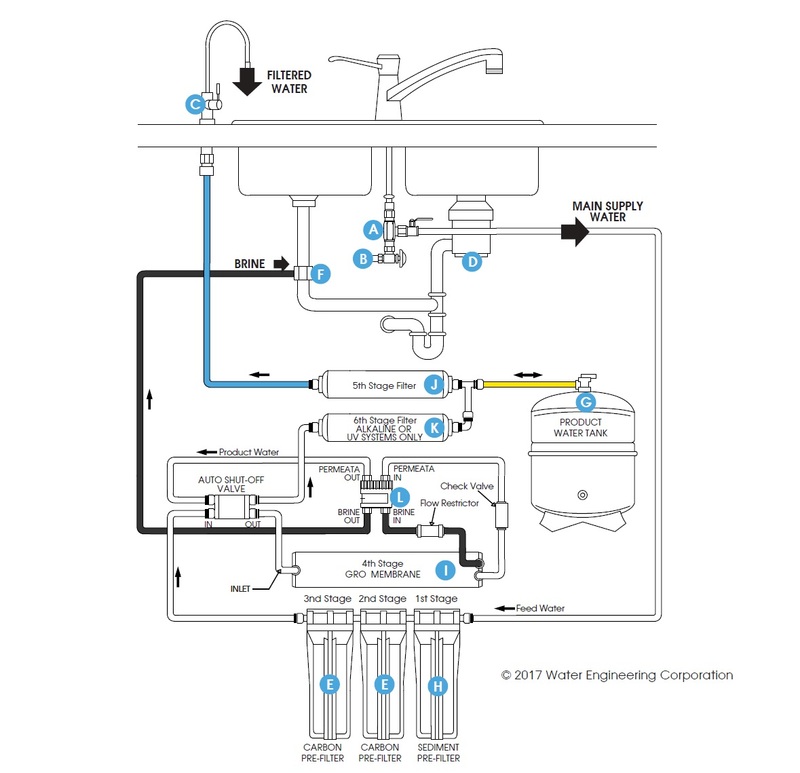 This four-stage water filtration systems uses the same high-efficiency water purification technology as the WECO HYDRA-75ALK, but in a compact configuration. The 30-micron polypropylene pre-filter removes sediment, rust particles, sand and other microscopic debris that can contaminate the water supply. The 5-micron solid-block activated carbon block cartridge eliminates chlorine, chloramine, bad tastes and odors, chemicals and carcinogenic disinfection byproducts. The encapsulated reverse osmosis filter uses an ultra-efficient membrane with a 1:1 ratio of waste to pure water production. The membrane removes metals like cadmium, lead, zinc and copper. Nitrate, sodium and fluoride are stripped out, reducing the TDS and improving the water quality. The GAC post filter scavenges out gasses and tastes for great-tasting water. For more information about WECO filtration systems or if you would like to discuss your water quality issues, please contact one of our Certified Water Specialists. Just about everyone is talking about the quality of their drinking water. But what is “good” drinking water? We hear about contaminated water supplies, chemical spills, bad tastes and odors but don’t understand what it all means. Unless you’re a water expert, it can be hard to understand what defines water quality. Not to worry! We’ll break it down into an easy to understand guide that will make you a well-informed consumer of drinking water. Let’s start by defining your water source. If you have a well your water is being pumped from an individual well located on your property. There is no federal or state oversight of your water supply. If you buy or sell the property there may be a requirement to have the well tested. You are responsible for the quality of your well water. All testing, conditioning and filtration is your responsibility. There’s a secondary group of contaminants that cause aesthetic problems like mineral scale (hardness), tastes, odors, laundry staining and other annoyances. These are not regulated by the federal or local agencies but can cause many unpleasant water conditions for homeowners. If your water is regulated, you will receive a yearly Consumer Confidence Report (CCR) from your local water supplier. The report must be mailed by July 1st each year. The report will provide a general overview of the water quality delivered by your water system. The report will list the regulated contaminants that were detected in the water and the level at which they were found during the preceding calendar year. The Consumer Confidence Report is for treated water only. If you receive a CCR but are using a well, the report has no validity regarding your well water quality. Do I need to filter my water? We’ve learned that municipal water is regularly tested for specific health concerns and wells must be tested by the well owner. Even if your water meets the federal and state regulations, it often contains substances and characteristics that cause unpleasant tastes, odors and undesirable side effects related to drinking, cooking, bathing and in the laundry. Nearly every water source can be improved with the right water filtration system. WECO water filtration engineers have designed an array of high-quality water filters ranging from small faucet filter to large industrial reverse osmosis systems. For residential applications we have a series of water filtration systems that are effective and efficient, meeting the needs of any water filtration need. 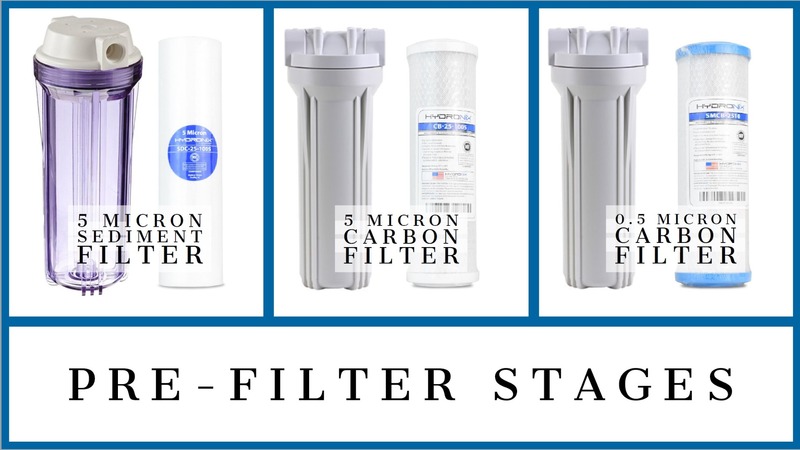 Here are a few of the most popular WECO filters and how they can improve your water quality. Hard water, high calcium & magnesium, is common with well and municipal water sources. Although hard water is not associated with health concerns, it causes numerous problems around the home. Hard water requires you to use more soap and detergents for cleaning, laundry and dish washing. Calcium reacts with soap, causing a waxy build-up in the bath tub and shower. When hard water is heated, it produces white mineral deposits on glasses and dishes. Mineral scale also forms inside water heaters, reducing efficiency, increasing energy costs and causing early failure of the water tank. The WECO UXC-0948 water softener eliminates hardness problems throughout the entire home. Your skin and hair will be silky smooth. Dishes and glassware will be spot-free. Cleaning chores will be easier and you’ll use less soap and cleaners too. The VGRO-75UV reverse osmosis filtration system is a state-of-the-art drinking water purification system. This compact filtration system uses the same water purification technologies used to purify water in nuclear submarines. The VGRO-75UV removes particles of grit, sand, fragments of insects and other solids that contaminate drinking water. Activated carbon filtration eliminates bad tastes and odors from chlorine, chloramine and natural organics that cause off-flavors. Even pesticides and solvents are removed! The reverse osmosis process removes nitrate, heavy metals and even mercury. 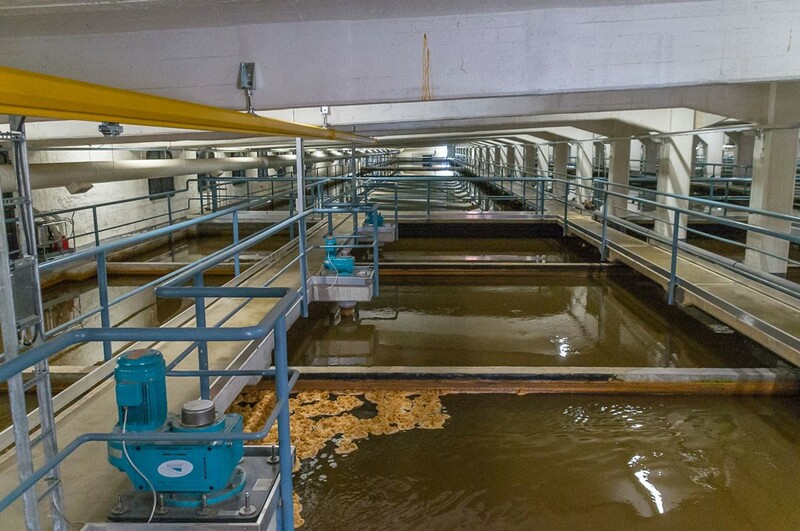 The purified water passes through an ultraviolet disinfection unit that kills and inactivates bacteria, parasites, and other microbes that infiltrate well and municipal water systems. If you want the absolute best-tasting pure water in your home, the VGRO-75UV is for you! Many wells suffer from acidic water. As groundwater passes through certain types of rock formations, it can become acidic. This causes the water to become very corrosive to metals. Acidic water will dissolve away the metals in faucets, releasing copper, lead, cadmium, and zinc into the water. It will also dissolve copper pipes, leading to blue stains in the sink, tub and toilet. This corrosive water will also reduce the lifespan of water heaters, dishwashers, and washing machines. The CALC-0948 backwashing filter neutralizes acidic water as it enters the home, protecting every sink, toilet, bathtub and appliance in the home. The natural calcite filter media eliminates water cloudiness, red iron stains, blue copper stains and stops acid water damage throughout the entire home. Nitrate contamination is a nationwide concern. Nitrate in drinking water poses a special risk to infants under six months of age. Nitrate prevents the infant's blood from carrying oxygen. Death can result if not treated promptly. Many adults also want to limit nitrate in their diet due to possible health effects associated with nitrate consumption. Removing nitrate from well and municipal water supplies is easy with a WECO A300E-0948 Backwashing Filter with A300E Ion-Exchange Resin. The automatic backwashing filter contains a special ion-exchange resin that selectively removes nitrate from your drinking water. This is a whole house filter that will provide every faucet throughout your home with nitrate-free water. WECO designs and manufactures a wide array of water filtration systems. We can specify a solution to your individual water purification needs. Please contact our technical service department to discuss your water purification needs. These are a just a few of the water quality issues that can reduce your quality of life and cause real damage in your home. Water quality affects every aspect of your life including cooking, cleaning, drinking and bathing. Even pets can be impacted by the water you give them to drink! Some folks think well water, unlike municipal water, is always fresh and contaminant free. Others know private wells can suffer from contamination and believe treated water supplies to be “as good as it gets.” Neither of these views are completely true. Even wells far away from industrial areas can be contaminated with microbes, nitrate and suffer from taste and odor problems. Likewise, water from a treatment facility that is disinfected and safe can leave hair dry and brittle, cause itchy flaky skin and cause your water heater to fail and leak water throughout the home. Water quality experts know that no two well or municipal water sources are the same. Every situation needs to be evaluated based on the symptoms and water needs of the home. In many cases a water analysis is required to correctly diagnose the problem and correctly design the water filtration system. A water analysis saves time and money by revealing the chemical make-up of your water so the proper treatment process can used. Guessing about water chemistry is a sure path to disappointment and wasted money. One of the most common water tests is an analysis of water hardness. Water hardness is the measure of calcium and magnesium in the water. Hard water (high in minerals) is responsible for white spotting on glassware, mineral crusts and early water heater failure. It is important to know the water hardness level to proper size a water softener. If the water softener is too small it won’t properly soften the water. The United States Environmental Protection Agency (EPA) maintains an online-list if certified water testing laboratories. 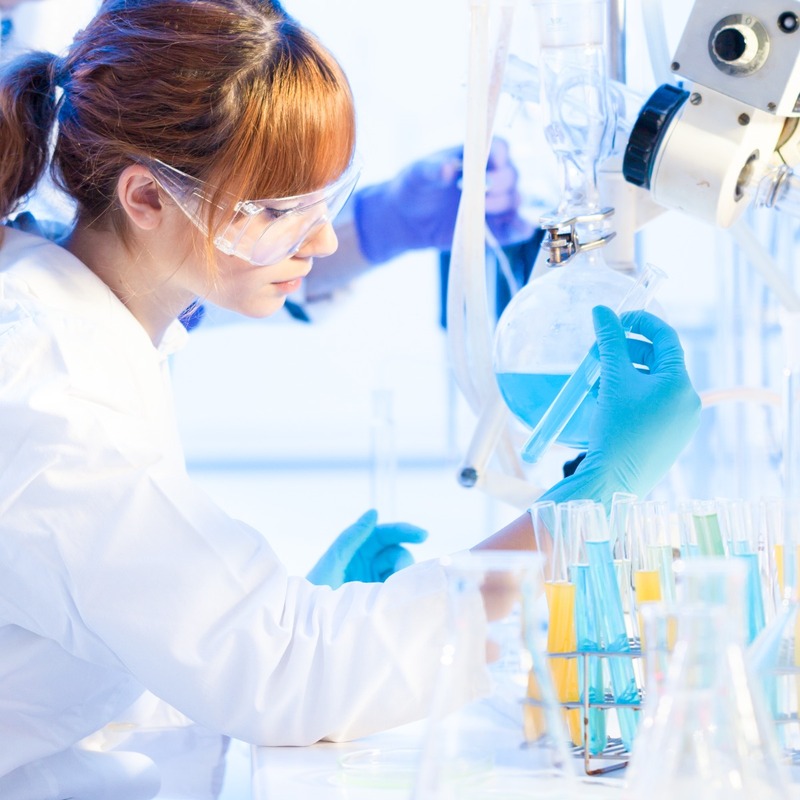 WECO technical support can also assist you with finding a certified water testing laboratory. It only makes sense to use a whole house filtration system so every source of water in the home is properly filtered and conditioned. Wouldn’t it be great to have fresh-tasting water at every faucet? Whole house filters are the only way to protect your entire home from contaminants like iron, sediment, hard water and other water-borne substances that create health and aesthetic problems along with damage to water heaters, clothes washers, ice makers, faucets, showers and other water-using appliances. WECO specializes in whole house filtration systems that are effective, simple to operate and properly filter all the water used for cooking, drinking, cleaning and bathing. 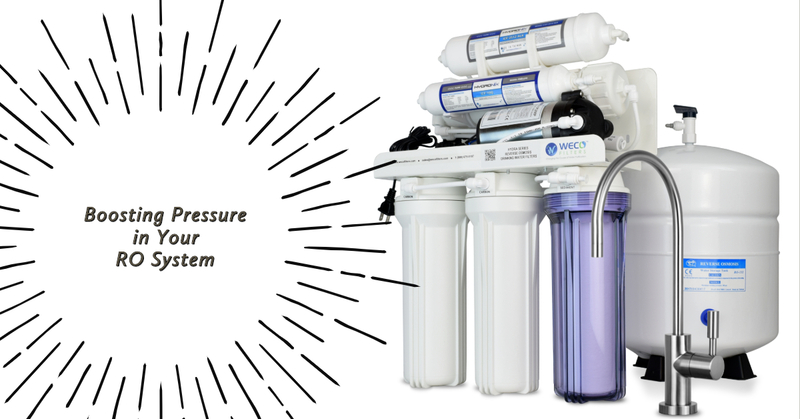 WECO Big Blue systems use commercial-grade components and replaceable filter cartridges. For higher capacity or specialized water treatment needs, WECO backwashing filters are available with a variety of problem-solving filter media. 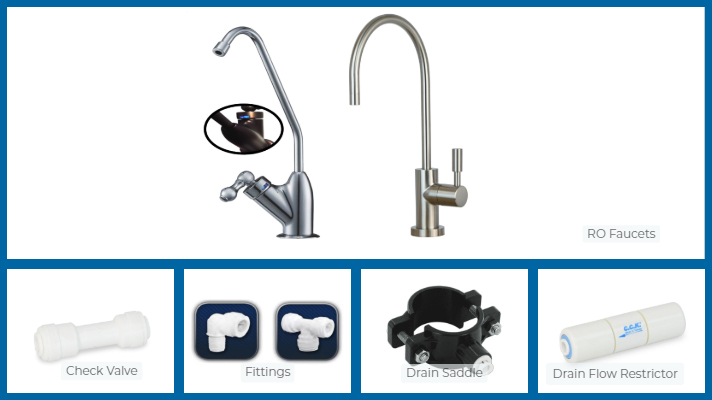 Here are just a few of the WECO whole house filtration systems that will protect your household and provide great-tasting purified water throughout your home. Well and municipal water systems often contain suspended particles of sand, rust, mineral flakes and even insect fragments. These sediments clog faucet aerators, shower heads, ice makers, dish washers, washing machines and even counter-top coffee makers. The WECO Big Blue Sediment Filter installs on your incoming water line. The canister contains a replaceable spiral-wound polypropylene filter cartridge that removes particles down to 5 microns. The Big Blue Sediment Filter can be used alone but is often used in conjunction with an activated carbon filter for improved taste and odor. The WECO Big Blue Taste and Odor Filtration System uses the same high-quality Big Blue filter housing but contains a compressed block of porous activated carbon for taste and odor control. The 5-micron porous network captures and removes chlorine disinfectants, musty odors caused by organic matter, pesticides, solvents and more. The WECO BB-203SKDFC is a three-stage point-of-entry water purification system. The filter uses three Big Blue filter housings, each with a high-capacity 20-inch filter cartridge. This system has three stages of water purification. Water passes through a 5-micron sediment filter, a mixed-media blend of catalytic KDF and granular activated carbon for removal of chlorine and chloramine and a final solid-block activated carbon polishing filter cartridge that removes pharmaceuticals, pesticides, tastes, orders and other contaminants. If you’ve got iron, manganese or rotten egg odors, a WECO backwashing filter loaded with Katalox Light® is the ideal problem-solver. Hydrogen sulfide (H2S) is responsible for noxious “rotten egg” odors in bath water, showers and drinking water. Hydrogen sulfide is corrosive to metals such as iron, steel, copper and brass. Katalox Light® oxidizes and precipitates soluble iron, manganese and hydrogen sulfide, which are flushed away in the automatic backwash operation. This filter also removes lead, copper, radium, uranium as well as other heavy metals and radionuclides. If you’re concerned with arsenic or fluoride in your drinking water, a WECO Backwashing Filter with Activated Alumina is right for you. With increasing health concerns for these substances, WECO has designed the AAL-1252 to address these contaminants. This automatic backwashing system will strip out fluoride and arsenic, protecting you, your family and pets. Source of Nitrite: Nitrite (N2O-) is a nitrogen-containing chemical similar to nitrate. Nitrogen in fertilizers, animal waste from farms and decaying plant materials can introduce nitrite into groundwater. Malfunctioning septic systems can also be a source of nitrite in well water. Nitrite can be found in municipal water but it mostly occurs in well water. Health Effects of Nitrite: Nitrite reduces the blood’s ability to carry oxygen. This causes a condition called methemoglobinemia. Babies and pregnant women are particularly susceptible to nitrite poisoning. Ingesting nitrite can have a negative impact on the development of the child. Blue Baby Syndrome causes the infant to turn blue and suffer from lack of oxygen. How to Remove Nitrite: A WECO reverse osmosis filtration system will remove nitrite along with nitrate, taste and odor-causing chemicals like chlorine and hydrogen sulfide and heavy metals including lead and arsenic. For whole house and commercial (Point Of Entry) applications a WECO backwashing filter with anion-exchange resin is recommended. Contact WECO for help in the selecting the water filter best suited for your application. Source of Legionella: Legionella (Legionnaires disease) is a respiratory disease caused by bacterial infection. The bacteria are found in nature but can be found inside hot water heaters and large plumbing systems. The bacteria enter the body through mist droplets that are inhaled. Showers can be a source of contact. Health Effects of Legionella: The bacteria cause symptoms including fever, chills, cough, or muscle aches. It is particularly harmful people over 50, smokers and immune-compromised individuals. The infection may lead to lethal pneumonia. How to Remove E. coli: A Polaris Scientific Ultraviolet Disinfection System is recommended to counteract E. coli contamination. The Polaris system will kill the bacteria as water passes through the UV radiation, rendering the water safe to consume. The Polaris UV system can be used on residential and commercial applications.